I’ve been dabbling in genealogy for years (and years and years! ), uncovering interesting information about my family history. Many of my ancestors moved to Chicago from Maryland, Ohio and Virginia; some immigrated to the Windy City directly from Germany, Norway, Sweden and Switzerland. That’s why I share so many references to resources in and about Chicago as well as transcriptions of Chicago obituaries and others news items. My DNA is a mixed bag from France, Great Britain, Germany, Isle of Man, Norway, Sweden and Switzerland, so you’ll also find information about doing genealogy in those countries. I began my family history research way back in the days of letter writing and microfilm reading. These days most of us start on the Web, getting into the trenches only when the internet fails us. 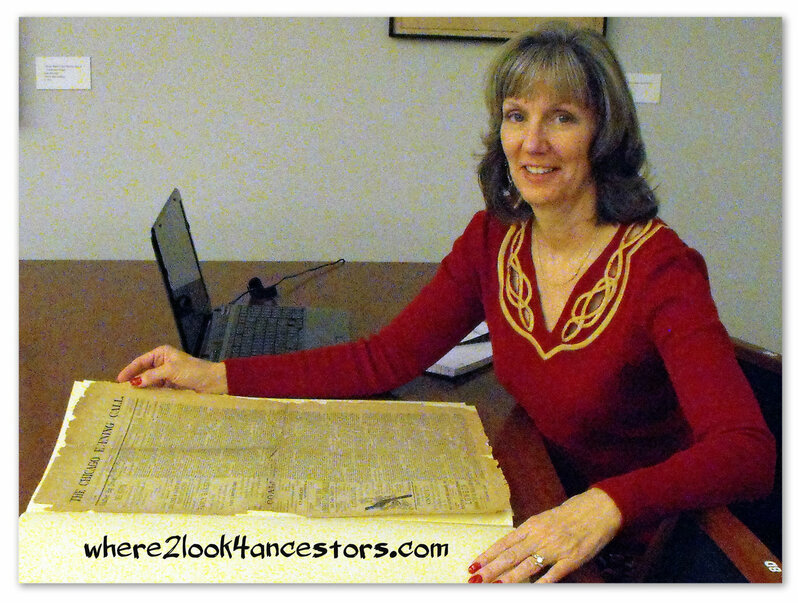 As I review stories and sources I’ve uncovered while preparing to write my family history books, I’ll share what I learn about my online and offline research. When I’m not spending quality time with my ancestors, I enjoy beaches, biking, jogging, dining out, traveling, and most of all – hanging out with my husband, our families and our friends. I came across this tonight while searching for something else and the last name Borgwaldt sounded familiar. One of the people in my tree and Alma C Baumgarten married and Bernard Frederick Borgwaldt in Chicago 1899. I wonder if there would be any chance we might be connected. I show his father as being Frederick from Berlin.Don’t have much information. So glad you stopped by! Unfortunately, I don’t know about the Borgwaldts. Was someone with this surname mentioned in an obituary I posted? I believe the Trib is online. Check out my “Things” page; I’ve provided some newspaper related links there. Yes the church has the death information… except for the name of the cemetery. I am trying to obtain more info about the cemetery…I understand it was moved once from its original location. If I can find the date it was moved that might help. Where is the best place to look for her obituary? DOD of October 17, 1889. I’d start with the Chicago Daily News or the Tribune. I followed your link on Rootsweb to here. I found the Chicago obituaries from the 1890’s of interest. If you know of anyone who might be interested in taking a photo in Oak Woods Cemetery I would like to make contact. It is lot 145, section 3, Twilight Lane. I have a map I can send to show the exact location. I like your blog! Thank you for following my blog – always super fun to hear from another Chicago researcher. Shoot, I wish I had known about your quest while I was in Chicago just two weeks ago! I visited Oak Woods for the first time in search of my Mueller ancestors. Wouldn’t it be something if our Muellers were connected in some way? Like Eliz from the Cook County list on Rootsweb, I would encourage you to create a memorial for Anna on Find A Grave. With the detailed information you can provide, a photo volunteer shouldn’t be hard to find. I would also encourage you to create that memorial soon as the weather is turning cooler. Low temperatures can discourage all but the hardiest cemetery walkers. I’ll watch Find A Grave for Anna – good luck with your request! Well, I did some more checking and found she is not at Oak Woods. The First Ev. Lutheran Church of Blue Island had her death registration, showing a burial of Oct. 19, 1889 “on the cemetery”, but did not show which cemetery. There is no burial record for her at their cemetery (First Lutheran). I checked with a number of other cemeteries around Blue Island, and so far no results. I am thinking perhaps she might have been buried at their cemetery before it was moved (don’t know when it was moved), or the Old Blue Island cemetery, which is now Memorial Park. A number of graves were removed from there in the 20’s or 30’s. Maybe hers was forgotten somewhere, as the family all moved away from there in the early 1900’s. Anyway, any advice I can receive as to where to search would be greatly appreciated. Would there be an obituary somewhere around that date? Thanks. I’m intrigued. Why would the First Ev. Lutheran Church of Blue Island have the death registration; was she a member of that church? How odd that she isn’t buried there, I would assume “on the cemetery” would mean burial in the cemetery that belongs to the church. Have you gotten a copy of the death certificate? Burial locations are generally noted on the death cert. Obituaries are one of my favorite sources of information, but remember the family would have had to pay the newspaper to print one. It’s always worth looking for an obituary. I’ve had great luck with the Chicago Daily News; that’s just one of several other newspapers published in Chicago in 1889. If this were my ancestor, my next steps would be to hunt down a death certificate and look for an obituary. I’m curious about that death registration at the church; are there any other clues there? I am enjoying your blog. Perhaps we are cousins — my great great grandffather was Aanon Jensen, from Dypvag, Aust-Agder, Norway, so his children were Aanonsen’s, my great grandmother being Aase Andrea Anonsdr. Do you have a family tree posted anywhere I can view? I have English ancestors on my maternal side. I look forward to sharing more information with you. Thanks so much for connecting! I asked my husband about the names you mentioned, but none of them are in his tree. His great-grandfather was Aanon Rasmussen, born in Vest-Agder in 1834. What a brilliant way to start your family history search; I’m looking forward to reading about your research. Thanks for following Shaking the Tree. I very much enjoyed your blog as well! Thank you kindly. My name is David Kalaskie (Born 1962 in Joliet) and I live in Chatham, Illinois with my wife Becky. My mother’s maiden name is Beverly Elaine Tolf (born 1938) and her father’s name is Clarence Ferdinand Tolf (Born 1894 or 1896 I think). He married Florence Munger in or around Batavia I believe. I seriously need to ask my mom some more questions and start writing this down. I know very little about my family and I found your blog very interesting to say the least. Thank you for your time. So glad to “meet” you! I sent you a message via private email. Hope to hear from you soon! But what was in Unkie’s safe deposit box? There must have been something that made it worth the trouble for him. How nice of you to ask! Unkie was an accountant, so he saved financial information. The box contained receipts and related items, a stock certificate, and a couple invoices. There were some genealogical clues, like home addresses and work places, but nothing that made my heart race. Since then, my family found photos of Antie and Unkie as children and as young adults. Because they were “old” when I was born, it was hard to imagine them young! What fun it has been to combine the photos with census records and other documents to tell their story. Thank you for asking about the safe deposit box – I look forward to reading more of your blog; it’s one of my favorites! Thank you for following – and for the “warm fuzzies”! Stopping by from Geneabloggers. Welcome to the family! We too have a rather demanding, big on personality pooch who likes to snooze on the arm chair in my study whilst I ponder the next genealogical puzzle!